If you prefer to go a more unconventional route with your engagement ring, then why not opt for a colored gemstone style? While blue gemstones have gained a lot of traction among couples ever since Kate Middleton first debuted her sapphire engagement ring, there's another bold, elegant gem that's quickly becoming a favorite. Any guesses? We're talking about beautiful emerald engagement rings—and aside from being eye-catching, emerald is known as a stone of successful and abundant love, which is quite perfect, especially considering the meaning of engagement rings—wouldn't you agree? 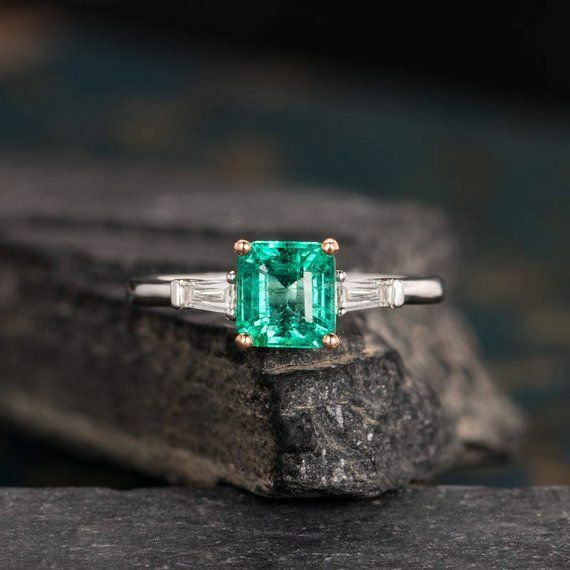 Now there are an abundance of dazzling styles on the market right now (and we found the best of the best below), designed with large emerald center stones or something a bit subtler, there are rings featuring smaller gem accents that are perfect for the minimalist. 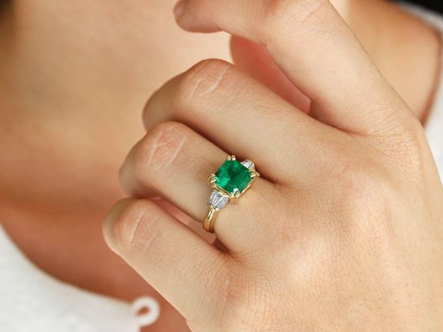 Whatever your jewelry preference is, you'll certainly fall in love with one (or more) of the emerald engagement rings ahead. Next up, shop the prettiest minimalist engagement rings.